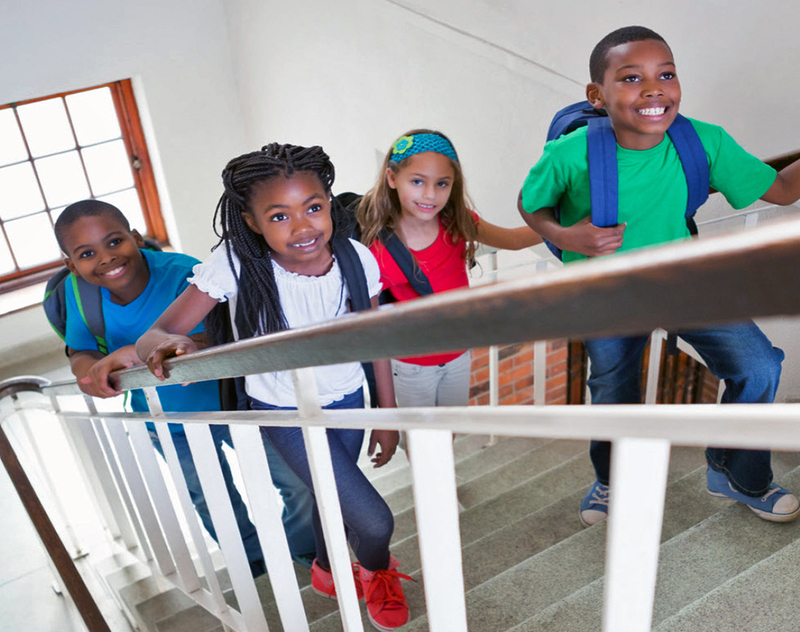 The three-year grant will allow the Louisiana Department of Education and Well-Ahead Louisiana to support healthier school environments that are conducive to healthy eating and physical activity through resources, funding and professional development to schools. Shout-out to Bayou Chicot Elementary in Ville Platte, LA for incorporating nutrition education into the classroom! Lessons from the USDA's Serving Up MyPlate: A Yummy Curriculum are being taught during PE classes. Here, students are learning what it means to eat healthy and writing about it in their own words. 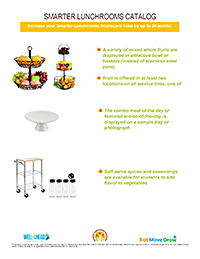 To learn more about this free curriculum, check out Serving Up MyPlate: A Yummy Curriculum. Bains Elementary will create an environment conducive to healthy eating by implementing Healthy Choices on the Geaux to provide healthy options for students to choose to add to their school lunches. The school will communicate health messaging to students and families via the Nutrition Nuggets newsletter, and nutrition education will be incorporated into a 5th grade classroom using Serving Up MyPlate: A Yummy Curriculum. Bains Lower Elementary will create an environment conducive to healthy eating by implementing Healthy Choices on the Geaux to provide healthy options for students to choose to add to their school lunches. Bains Lower Elementary will communicate health messaging to families and students via the Nutrition Nuggets newsletters. They will utilize posters to communicate information about making healthy food choices. The school will implement Serving Up MyPlate: A Yummy Curriculum into a 1st grade classroom. Bayou Chicot will create an environment conducive to healthy eating by utilizing a mobile kitchen station for healthy cooking demonstrations and taste tests. The school will communicate health messaging to students and families with printouts. Recipes from cooking demonstrations/taste tests, and healthy eating habits/physical activity information will be copied and printed for students and their families. 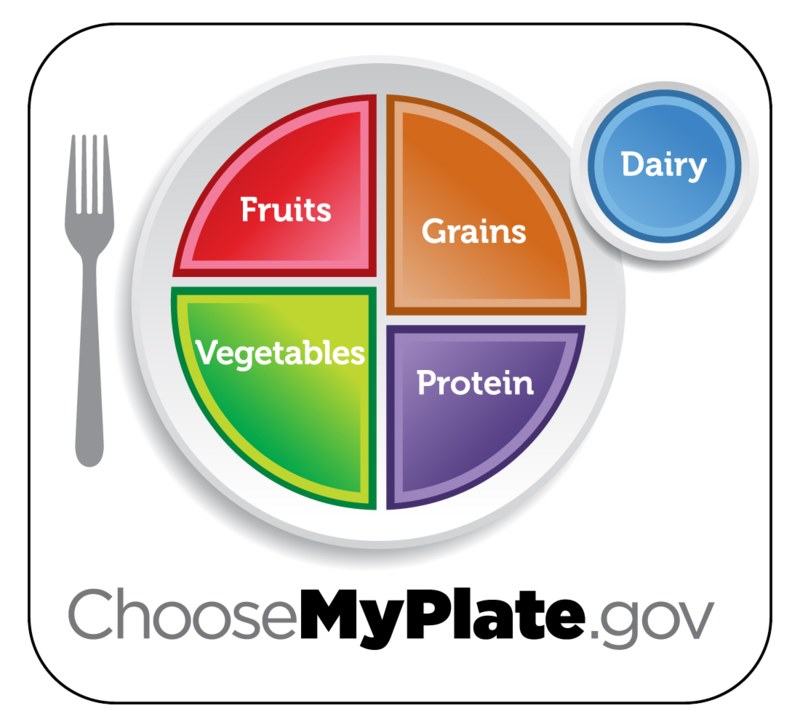 Selected classroom teachers will incorporate the Serving Up MyPlate: A Yummy Curriculum in their classrooms. Cohen College Prep will create environments conducive to healthy eating and communicate health messaging through installation of signage in the cafe and health center. In addition, the JKL Fit Club will conduct fresh, local food tastings during lunch, and healthy food prep demos after school. Nutrition education will be incorporated into Anatomy and Physiology courses for most sophomore scholars, and in Health classes as well. Evangeline Elementary will create environments that are conducive to healthy eating by hosting a taste test party and by planting gardens in raised beds. Nutrition education will be incorporated into PK-2nd grade science lessons and 3rd-5th grade PE classes using the USDA Serving Up MyPlate: A Yummy Curriculum. The curriculum will be translated to French to be used in French Immersion classes as well. Evangeline will update families on the school garden and healthy eating information taught in science and PE classes via newsletters. Iota Elementary will create environments that are conducive to healthy eating by offering Breakfast in the Classroom and taste tests, and by providing students with proper temperature prepared food. Iota will incorporate USDA Serving Up MyPlate: A Yummy Curriculum as nutrition education, as well as creating stations in PE class where the students need to know a healthy item and perform an exercise routine to promote a healthy lifestyle. Iota will also teach students the difference of what the inside of their bodies would look like depending on their diet. 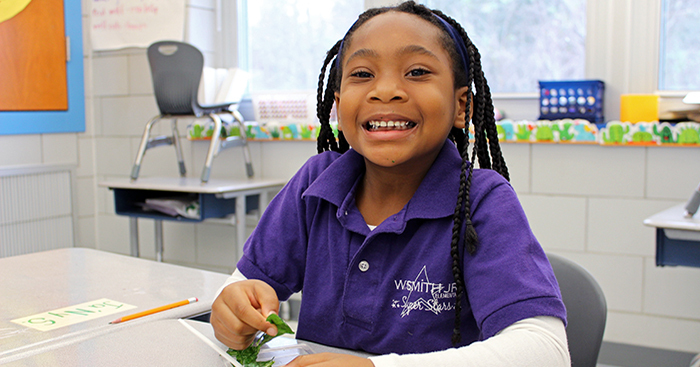 Mary D. Coghill Charter will create and maintain a school garden and host monthly taste testing events using garden-fresh foods to create environments that are conducive to healthy eating. Nutrition education will be incorporated into the classroom using Serving Up MyPlate: A Yummy Curriculum and lessons around the garden. In addition, Coghill will take a field trip to visit a local youth community farm! Utilizing materials from the LA Harvest of the Month program and Serving Up MyPlate, Coghill will communicate health messaging in the cafeteria and around the school. Northside High will create environments that are conducive to healthy eating by providing a kiosk for “grab-and-go” breakfast to make healthy breakfast options available to all students. In the cafeteria, attractive serving baskets will be purchased that will make whole fruits more appealing and convenient to students. 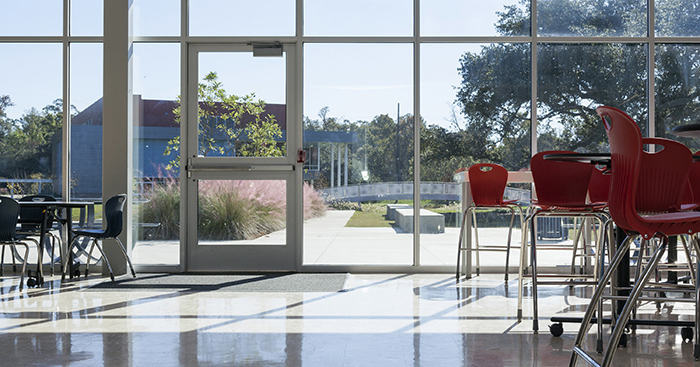 The school will communicate health messaging by installing signage that features nutrition facts of foods served in the cafeteria to help inform students’ choices. Opelousas High School will create an environment conducive to healthy eating by creating a school garden. They will enhance their lunchroom with two new digital menu boards! The school garden will be used as a venue and resource for monthly nutrition education and agriculture lessons. 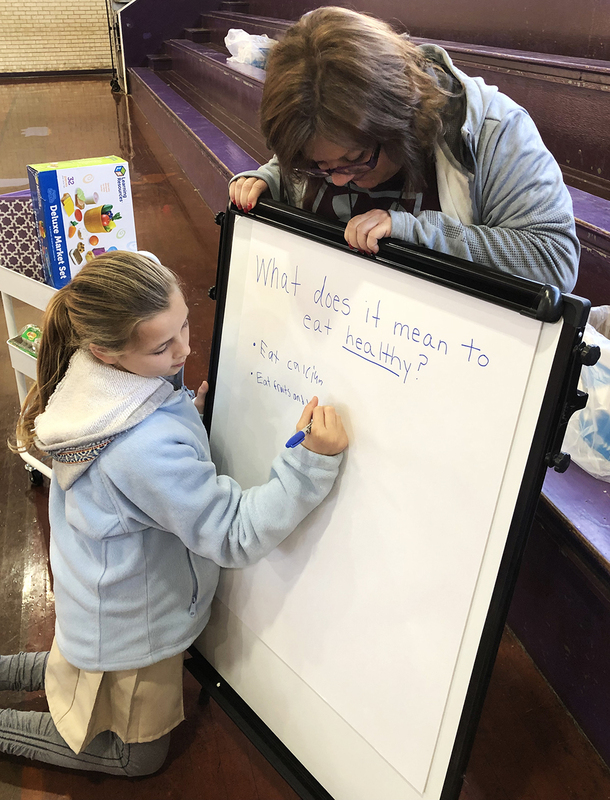 Opelousas High will communicate with students and families about healthy eating by sending home monthly newsletters and by utilizing signage around the school. Raintree Elementary will enhance their lunchroom with a new, digital menu board to showcase menu items. The school will incorporate Serving Up MyPlate: A Yummy Curriculum nutrition education into 5th grade classrooms and improve the existing school garden. Raintree will communicate health messaging on the school website and will publish wellness information in the monthly newsletter. ReNEW Schaumburg Elementary will create environments conducive to healthy eating by enhancing their breakfast pick-up stations with tablecloths and serving platters and will utilize signage to promote healthy eating. Nutrition education will be incorporated into the classroom by implementing the USDA Serving Up MyPlate: A Yummy Curriculum in K-2 physical education and health classes, conducting Louisiana Harvest of the Month taste tests, and create classroom potted gardens. ReNEW Schaumburg will communicate with families by sending home monthly newsletters with healthy eating information and by providing healthy recipe cards at parent events. Rosenwald Elementary will create environments conducive to healthy eating by enhancing their school cafeteria with decorations that reflect seasonal vegetables and fruits, daily menu boards, and sample healthy meals on display. Rosenwald will incorporate Serving Up MyPlate: A Yummy Curriculum nutrition education into Health and PE classes for grades 1st-3rd, and the school will host a contest for student-created artwork reflecting healthy eating information they learn from the nutrition curriculum. Health messaging will be communicated across multiple channels including take-home recipes, school website, parent literacy nights, taste tests, and signage. 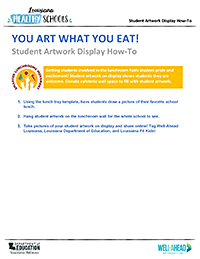 Stephensville Elementary will create an environment conducive to healthy eating by enhancing their cafeteria with artwork and by representing healthy food choices on class-created posters around the school. In addition, the school will start a sustainable school garden to be maintained by faculty and community members. The school will implement Walking Classrooms and accompanying health-embedded lessons to incorporate nutrition education in the classroom. 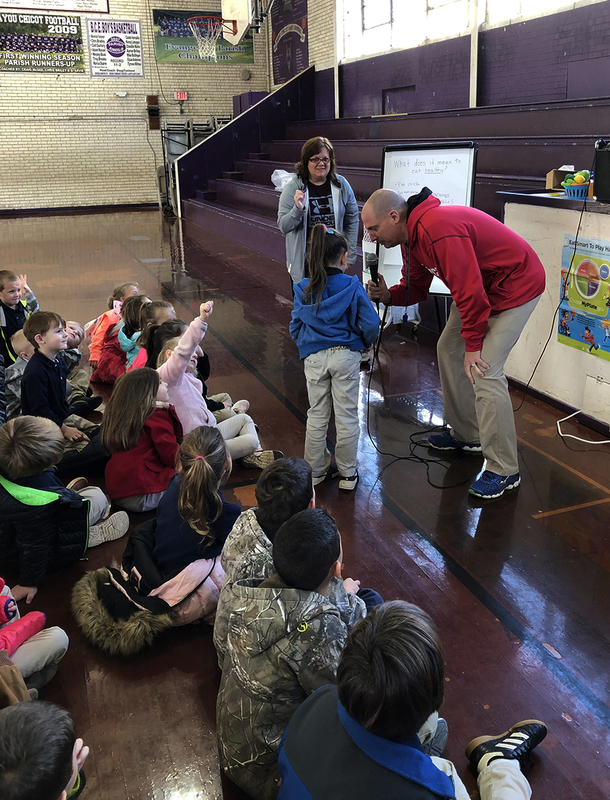 To communicate health messaging across multiple channels, Stephensville Elementary will send out health and fitness newsletters and host Try-It Nights to students, parents, and community members. Valverda Elementary will create environments that are conducive to healthy eating by purchasing a digital menu board to display breakfast and lunch menus in their newly-remodeled cafeteria. The digital board will also be used to communicate health messaging, and monthly recipe newsletters will be sent home to families. 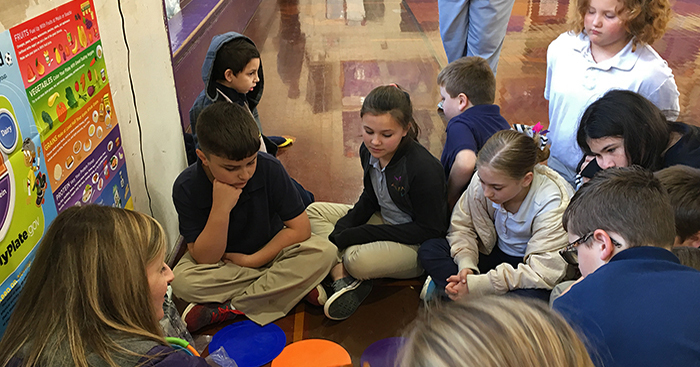 The school will incorporate nutrition education PE classes using Serving Up MyPlate: A Yummy Curriculum, and a portable wagon garden called “Garden on the Geaux” will be transported from class to class for all grade levels to learn from. W. Smith Jr. Elementary will create an environment conducive to healthy eating by implementing a tower garden for students to learn about how fruits and vegetables are grown. Students will be given the opportunity to try new foods through taste tests and seasoning stations. Nutrition education will be provided to 1st grade students during PE/Health using Juice Plus Tower Garden lesson plans and Serving Up MyPlate: A Yummy Curriculum. The Healthy Schools Training Krewe is a group of expert trainers that have joined forces to support healthier schools. At no cost, the Krewe provides professional development to those working to create healthier schools. The mission of the group is to enhance the knowledge and skills of those working to create healthier schools by providing professional development to schools and school districts. To request a workshop, fill out a Training Workshop Request Form! 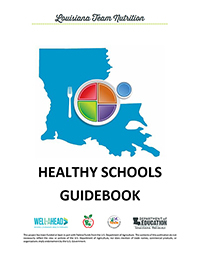 Visit the Louisiana Healthy Schools Eventbrite page to check out upcoming trainings and to register! 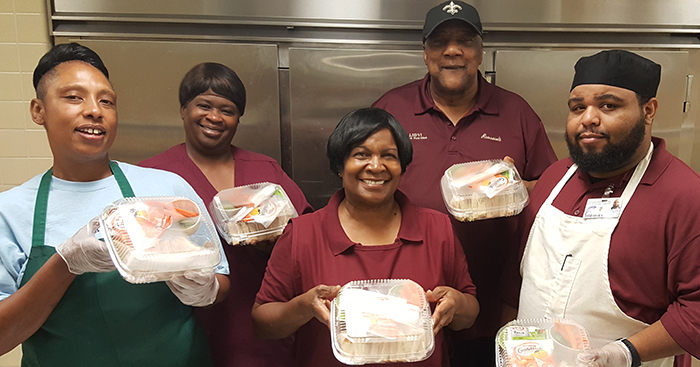 Louisiana Team Nutrition has launched a regional culinary skills training series that is focused on enhancing food preparation skills and knowledge of school food service professionals. To learn about the kick-off training in Baton Rouge, LA, read the Louisiana Team Nutrition Culinary Training Series - Part 1 blog post and view photos of the event on the Louisiana Team Nutrition Culinary Training 2018 photo page. Review school menus with your child, and encourage them to try new items. Offer to help with taste tests or other nutrition promotion activities.